WordPress hosts my blog. It is very good. It offers copious amounts of data about how the blog is being accessed as part of the package. And from some of this information I see that many of you are going to the Audio Samples and Performances, some of which, for several reasons, are not too satisfactory. However, Divine Art has placed some of the movements of Piano Sonatas 7 & 9 on youtube.com and all 49 minutes of Sonata 8. You might not get the best from listening to them without reading about what I am trying to accomplish in these pieces by means of my Non-Prescriptive techniques, especially in the case of 8 which goes where no man has gone before. 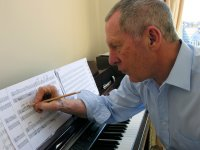 Some of the reviewers have written with great insight about this music in view if the fact that they have not been in possession of the scores. I have not got around to having them published yet. There is such a huge amount of time involved in this process that I do not wish to invest in this at moment. I am working on something that is taking all my energy and focus. Could I recommend that you at least listen to Mary Dullea’s realisation of movement No 2 from Sonata No 9. You will be witnessing a compelling, towering performance. I only wish you could see her at the piano. When she played this at Sheffield University last year the audience was quite astonished at what this slim, slight figure extracted from the piano. WordPress informs me that the blog you are reading is read in 76 different countries. It provides a global map and upon this chart illuminates which countries are viewing the blog on a daily, weekly, monthly, yearly and all time basis. The all time map covers most of our planet. When I am having a bad day composing, when nothing is happening, when things are in reverse, I think of all you thousands of people who bother to find me, read about this amazing journey I am on and return for further reading. I am so fortunate to have you as my readers. I never anticipated anything like this when I commenced the blog nearly 4 years ago. Now I must cease this love-fest at once! I am British and we don’t go in for this sort of thing! Please go and listen to Mary realise the data I supplied her with for the second movement of 9. If you care to submit a comment. I will put it up for the world to read. And yes – I play it but not quite like that. I am not Irish, I am older and I have a bad back. Since I first wrote the Introduction some 4 years ago I have developed further Non-Prescriptive techniques. In view of this evolution I have decided to update this section of my blog. I hope it is informative. It may be of interest to you to go to the reviews of my CDs and read how the reviewers and critics have themselves described these techniques. Some of them are exceedingly well written but I feel none is superior or more explanatary than Dr. Scot McLaughlin’s superb sleeve notes for my last CD.